In Outlook Customer Manager, your activities are linked to the appropriate contact, company, or deal automatically. For example, if you have a contact named Kim Mills stored in Outlook Customer Manager, with an email address of kim@contoso.com, every time you email Kim through Outlook, that communication is linked to Kim's contact record and Contoso's company record. You can also initiate activities from within Outlook Customer Manager. There are two ways you can see activities linked to an item. You can view activities from an email message you receive from a contact, or you can find activities through an Outlook Customer Manager contact, company, or deal. Open an existing email message and then choose Customer Manager from the ribbon. On the sender's detail screen, you can see all of the information Choose Show all related to see all activities for the contact. You can double-click emails or meetings to open them in their corresponding Outlook window. Companies, contacts, and deals will open in the Outlook Customer Manager pane. Choose either the Contacts, Companies, or Deals modules in Outlook Customer Manager. You can either pick the contact, company, or deal from the list, from the Focused slider, or search. When you find the item you're interested in, select it to open the item. All of your activity involving that company, contact, or deal is shown under Timeline. You can see the next upcoming activity scheduled as well as all past activities. For deals, as long as the deal is active, every email sent to one of the contacts linked to the deal is also linked to the deal. 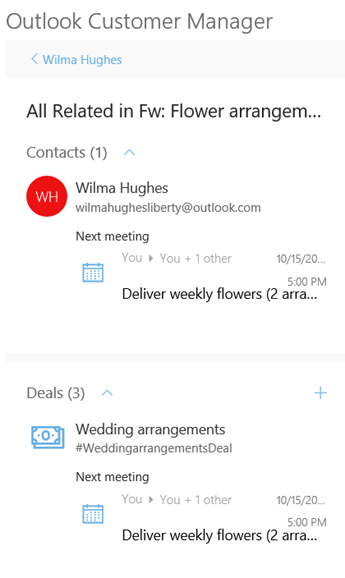 You can double-click emails or meetings to open them in their corresponding Outlook window. Companies, contacts, and deals will open in the Outlook Customer Manager pane.